How does Derby County’s squad shape up player by player? With the window closing for transfers I think we can take a look now at Derby’s squad which has seen plenty of incomings, but perhaps needlng more outgoings and those are now likely to be loans. Scott Carson has been one of our most consistent players ever since he arrived and theres no reason to suspect that his place will be under threat. The lack of an experienced back up goalkeeper is one of very few concerns I have in the squad. Andre Wisdom will be expected to carry on at Right Back or indeed he might even get a few appearances at his more natural position of Centre Half. He is expected to be part of the match day squad. Craig Forsyth struggled for consistency after coming back from two very serious injuries, I’d expect him to be available for a move. Craig Bryson will hopefully be sticking around. He’s looked as a true Derby man by the majority of fans and on his day is one of the best box to box midfielders around. Fikayo Tomori is a new loan signing from Chelsea and an England Under-20 player, He can play Right Back or indeed Centre Back. He should be a threat to both Wisdom and Richard Keogh! Richard Keogh will have to be on top form to keep his place in the team. Tomori could challenge him for a Centre Back shirt. Harry Wilson is a loanee arriving from Liverpool. He had a good few months at Hull City last season and is very highly rated! Expect him to start most games. Mason Mount is regarded as one of the best young players owned by Chelsea. Several teams would have liked him in their squad. Some Chelsea fans feel he could have broken into their first. Team squad this season. Martyn Waghorn was first linked with Derby over seven years ago! Since leaving Leicester he’s been at Hull City, Rangers and Ipswich Town. When he wasn’t scoring goals he was creating them last season. Some have questioned his signing, but he’s in the form of his career. Tom Lawrence started to show some form towards the end of last season and carried it forward into pre-season. His header which clinched victory at Reading last week will already be a contender for goal of the season! Can’t see many better goals coming. Florian Jozefzoon was signed when he looked set to be joining Leeds. A tricky winger that will bring some width to the team. Jack Marriott was one of the hottest properties outside the championship. A host of clubs were interested including our red rivals. I’d expect Frank Lampard to ease him into the first team. Bradley Johnson hasn’t been the most consistent of players, but maybe a few fresh faces in the squad will push him a bit harder and bring some much needed competitor. Alex Pearce played the part of a squad player last season and he may be gone if a club comes in for him. He will want regular first team football. George Evans is a defensive midfielder who Lampard knew at Manchester City. He can also play in the centre of defence. Jacob Butterfield spent the latter half of last season on loan at Sheffield Wednesday. He doesn’t appear to have a future with The Rams. Chris Martin failed to become a first team regular in his return from Fulham last season and was eventually loaned out to Reading. A move might rejuvenate him. A class act on his day. Mason Bennett provided the superb cross for Lawrence’s winner at Reading. He will be hoping to make the breakthrough this season. It looked like he was going to last season until he got injured. Kelle Roos has been on the bench, but he struggled in the championship when loaned to Rotherham. I don’t see him ever being a first choice goalkeeper for Derby. Nick Blackman was a £2.5m signing by Paul Clement and has failed to make any sort of impact. He was loaned out last season and that would be the best route whilst his contract runs down. Max Lowe is a promising young Left Back and I’m hoping he will stay at the club all season. He has been loaned out in the past, but there is no doubting the lads promise. Hopefully he can stay clear of injuries. Jamie Hanson is expected to be loaned out or sold. Burton Albion expressed an interest. David Nugent is in the latter stages now of a successful career. I think he will stay. He’s a top professional and could be a good figure to have around the younger players. Marcus Olsson is a long term injury victim. Ikechi Anya is expected to be gone at some stage. Hasn’t really done it for Derby. Cameron Jerome came into some good form towards the end of last season and is a player who could stay or go. Curtis Davies our captain signed a new contract after Stoke City had shown interest in him and it’s no surprise Rowett came in for him. The guy was sheer class last season. He’s going nowhere! George Thorne has struggled and now looks a shadow of the player we signed. Two serious injuries and now well down the pecking order. Needs a move, loan or permanent. Jonathan Mitchell our third goalkeeper has made a few appearances, but is he ready should Carson get injured? Joe Ledley may find chances fewer now George Evans has be signed. Did a very good job for us last season though. Jayden Bogle an academy graduate who played in pre-season. Luke Thomas is a very promising youngster who has just signed a new contract. Would be quite a loan signing for a League one side. One for the future if not this season! Calum MacDonald is another youngster given a squad number. Louie Sibley is a very promising youngster. My favourite of all our young guns! Might not figure yet, but watch out for this lad in the not too distant future. Timi Max Elsnik has returned after a very successful loan spell at Swindon. Another very promising player who’s come through the ranks. Tom Huddlestone has attracted interest from Cardiff City. Top player on his day but will he fit into the Lampard style of play? Scott Malone is an attacking Left Back who has just joined us. 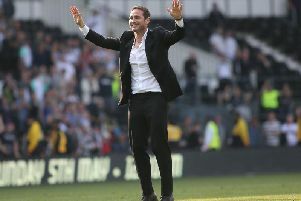 His signing is further proof of Lampard’s intentions of being an attacking side. Hopefully some of the above can be offloaded or we will have to start a second team!